The impacts of global warming are likely to rapidly and permanently change some of the most important places in the world. Designated for their global significance and universal value to humankind, many World Heritage sites are major tourist destinations. Some are among the most iconic places on Earth. Now rising seas, higher temperatures, intensifying weather events, and other climate impacts threaten many of these locations and the local economies that depend on them. 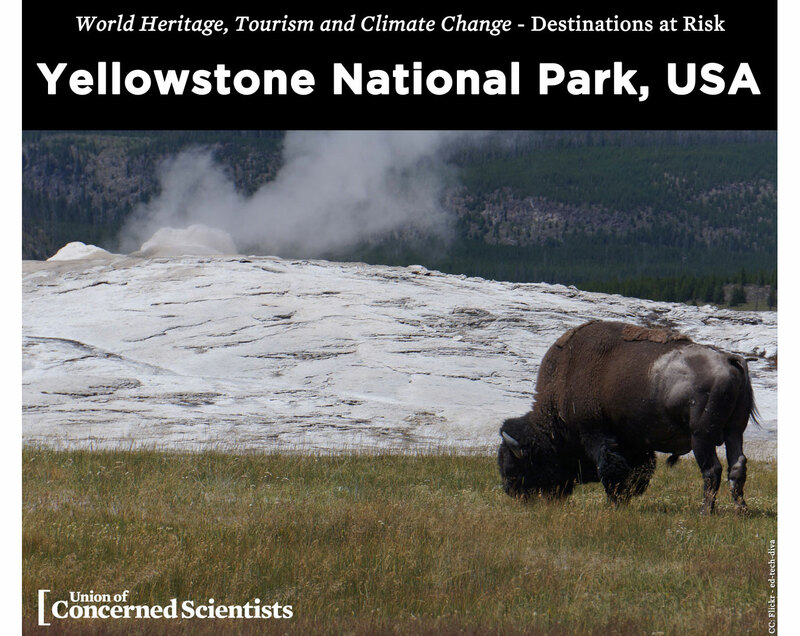 Climate change is already affecting Yellowstone National Park. Winters have become shorter, with reduced snowfall and less snow on the ground. Earlier snowmelt is impacting river flow and summer water temperatures are rising. Tree-killing pine beetles are flourishing in response to the shorter, warmer winters, and a longer wildfire season is also affecting forests. Over time, Yellowstone’s familiar landscape and ecology is likely to be dramatically transformed by climate change. 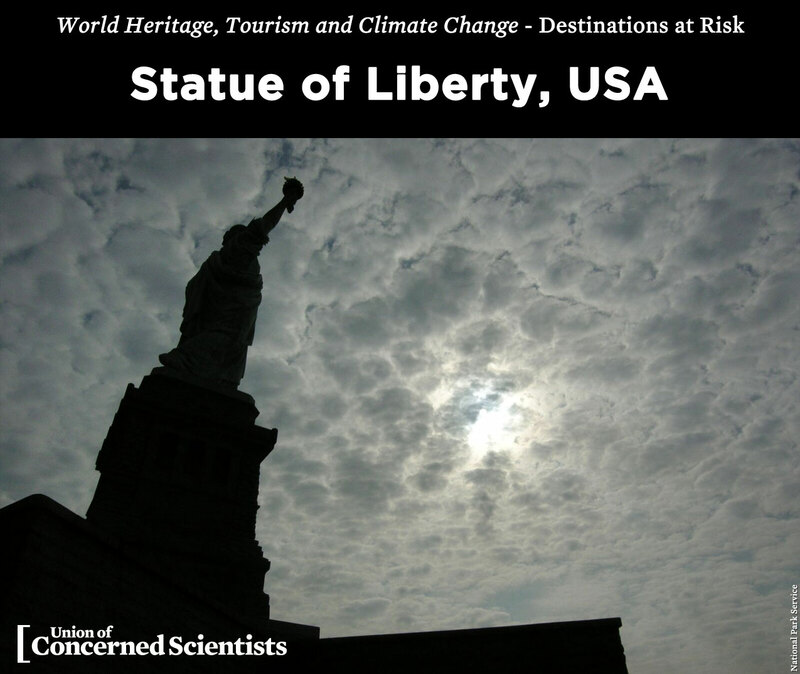 In October 2012, floodwaters from Hurricane Sandy inundated nearly 75 percent of Liberty Island, devastating jetties, walkways, electrical systems, and other infrastructure. The storm caused more than $77 million in damage to Liberty Island and Ellis Island. Climate change is dramatically increasing the likelihood of future storms like Sandy. 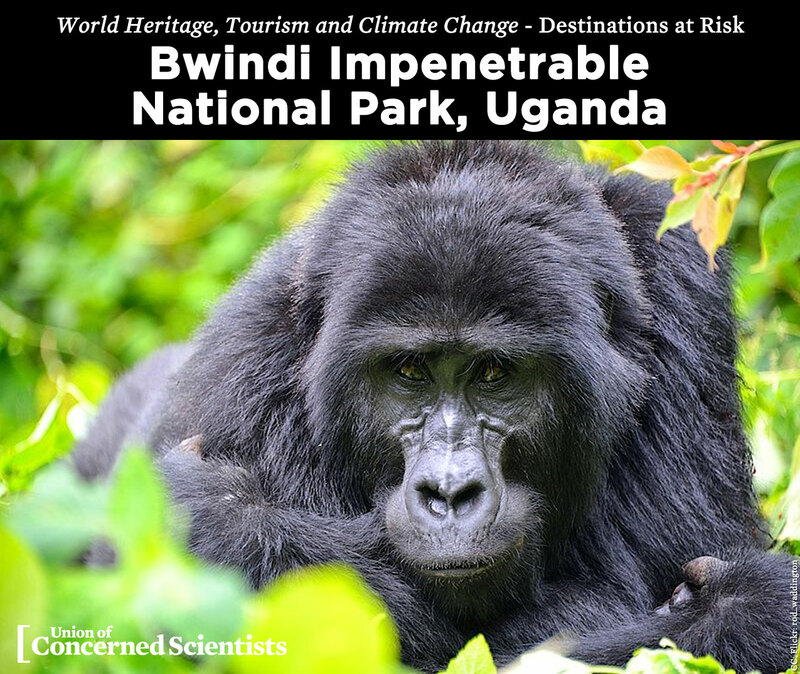 Fewer than 900 mountain gorillas survive in the wild and nearly half of these can be found in Bwindi Impenetrable National Park. Already at risk from habitat loss and human encroachment, gorillas will face new threats from climate change, including changes to their forest habitat and the increased danger of diseases being transmitted from nearby human populations and tourists. 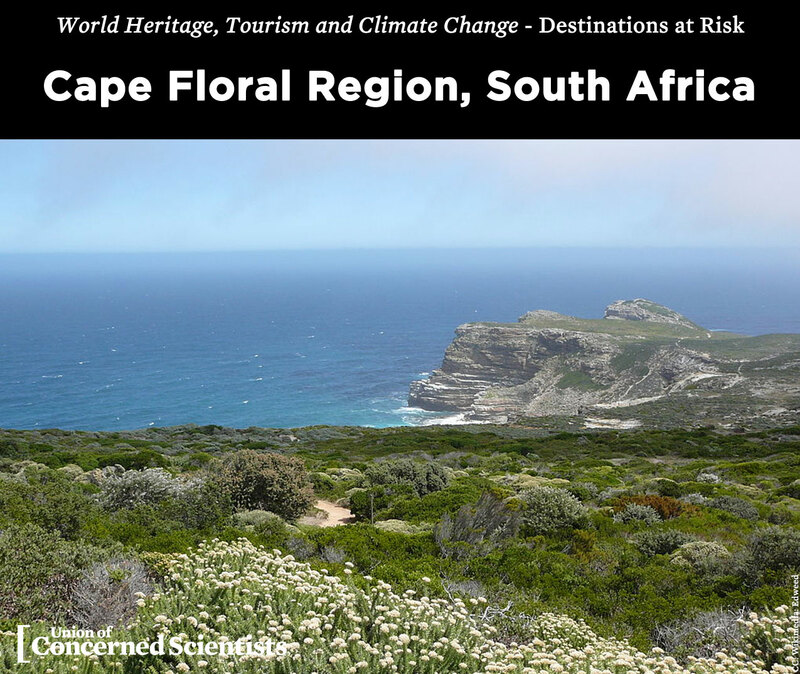 The Cape Floral region has some of the most biologically diverse plant communities on Earth. Its unique ecosystem is home to spectacular flowers including irises, proteas, and freesias. The region is already warming but is expected to become significantly hotter and drier, experiencing larger wildfires which will permanently alter the ecosystem. 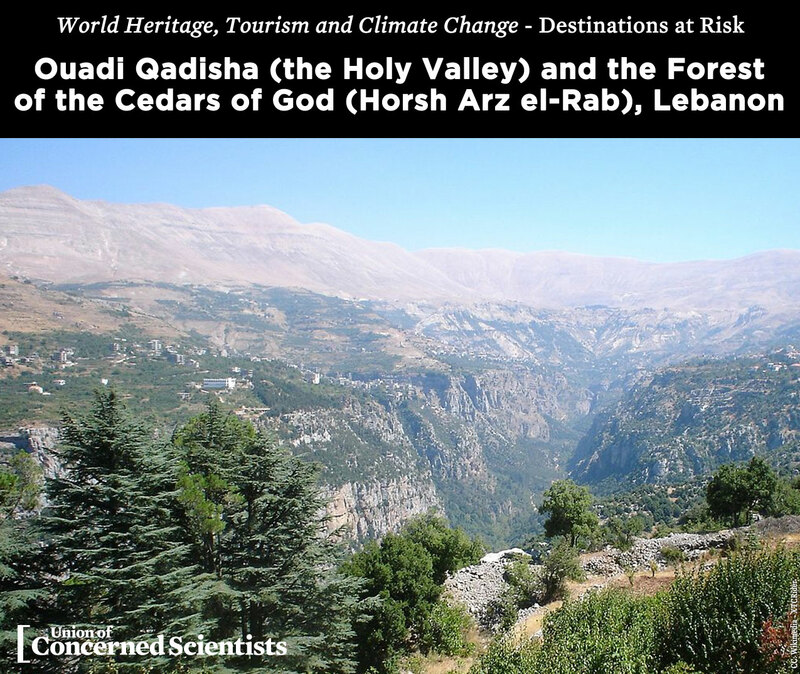 The Ouadi Qadisha World Heritage site in northern Lebanon protects monasteries and hermitages dating back to the earliest days of Christianity, as well as a globally important grove of sacred cedars, several of which are more than 1,000 years old. Warmer temperatures will reduce the availability of suitable habitat for Lebanon cedars and increase their susceptibility to insect attack and diseases. This exceptionally well-preserved example of a Far Eastern trading port, which was active from the 15th Century to the 19th Century, has more than 1,000 wood framed buildings, most of them more than 300 years old. Much of the historic neighborhood could be permanently inundated by mid-century as a result of sea level rise. 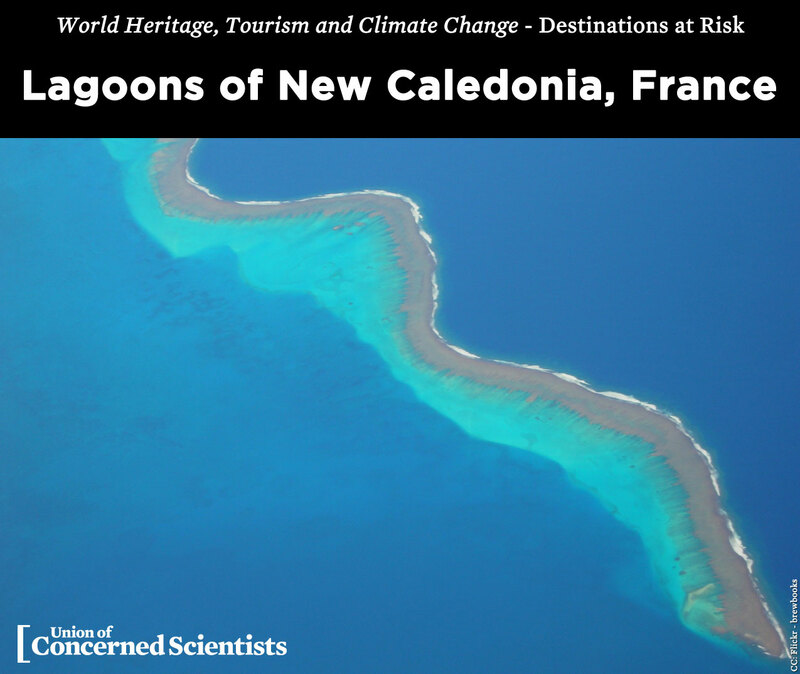 New Caledonia’s coral reef is one of the three most extensive in the world and has the greatest diversity of reef structures found anywhere. The 2015-16 El Niño event caused levels of coral bleaching that alarmed the scientists who work there. Higher water temperatures and more frequent or intense El Niño’s threaten coral reefs worldwide. The historic city of Cartagena is one of Colombia’s top tourist destinations, packed with squares, museums, churches, and ornate colonial buildings, including the Palace of the Inquisition and the cathedral. 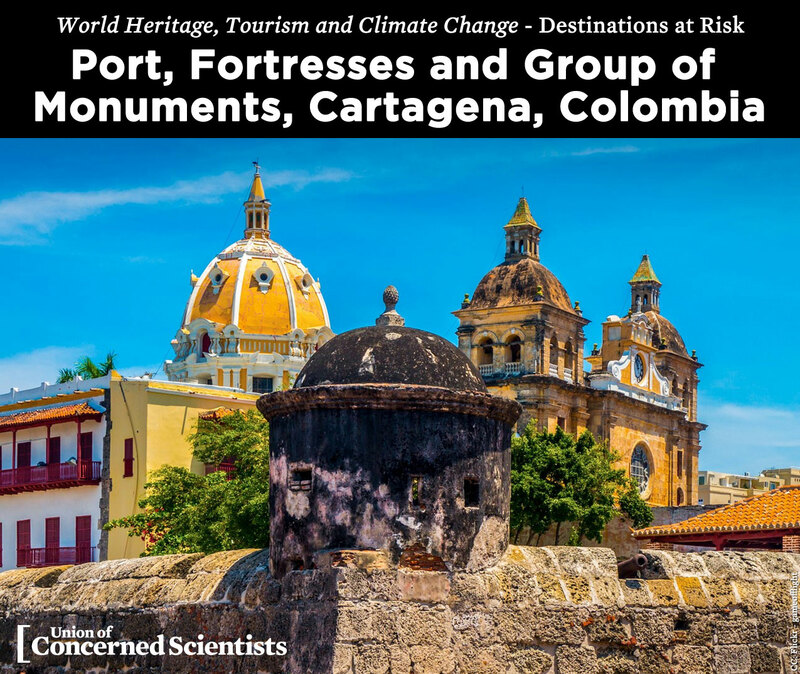 The city received World Heritage status for its array of 16–18th century military fortifications, built to protect Spanish colonial and trade interests in the region. In the region, low-lying Cartagena is one of the city’s most vulnerable to coastal flooding. Since 1993, the rate of sea-level rise at Cartagena has been more than twice the Caribbean average, and some of the city’s poorest neighborhoods are at greatest risk. A thousand miles from the mainland, and famous for the role they played in Charles Darwin’s formulation of his theory of natural selection, the Galapagos Islands are home to an extraordinary array of wildlife. Already under pressure from the rapid expansion of tourism in recent years, the islands are facing major new stress from climate change. 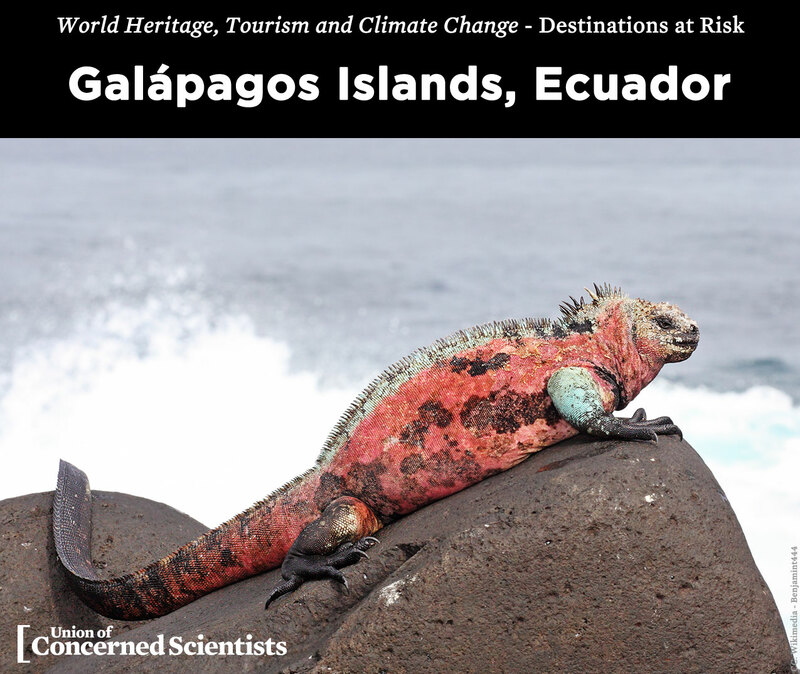 Of particular concern is the potential for more intense or more frequent El Nino events, which can be devastating for species including Galapagos penguins, marine iguanas, and sea lions. 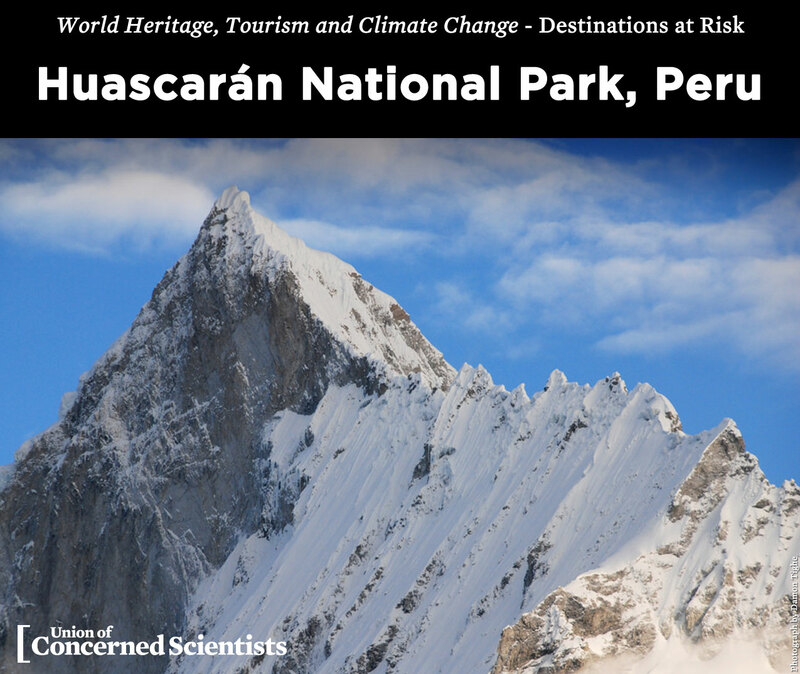 Situated in the Cordillera Blanca, the world’s highest tropical mountain range, Huascarán attracts tourists and hikers because of its spectacular landscapes and beautiful azure lakes. However, it is also a vital source of water for Andean communities and the rapid loss of glaciers in the mountain range is a major concern for the health and livelihoods of people in the region. Rapa Nui, or Easter Island, in the Pacific Ocean is the most remote inhabited island on Earth. 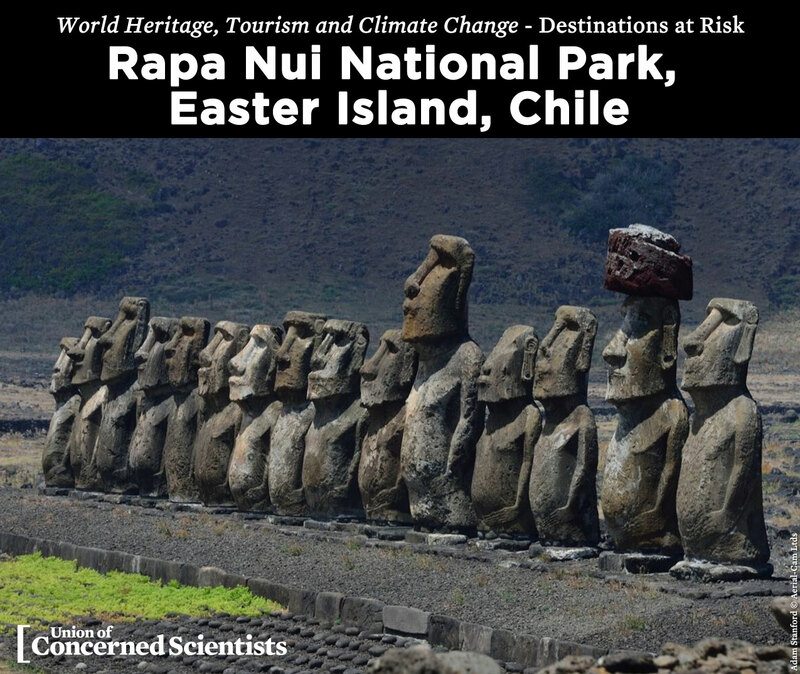 Most of the iconic carved moai statues and the ceremonial ahu platforms they stand on are located directly on the coast and significant coastal erosion impacts are already being recorded at several important archaeological sites. 5,000-year-old Skara Brae in Scotland’s Orkney Islands is the best preserved Neolithic settlement in northern Europe. 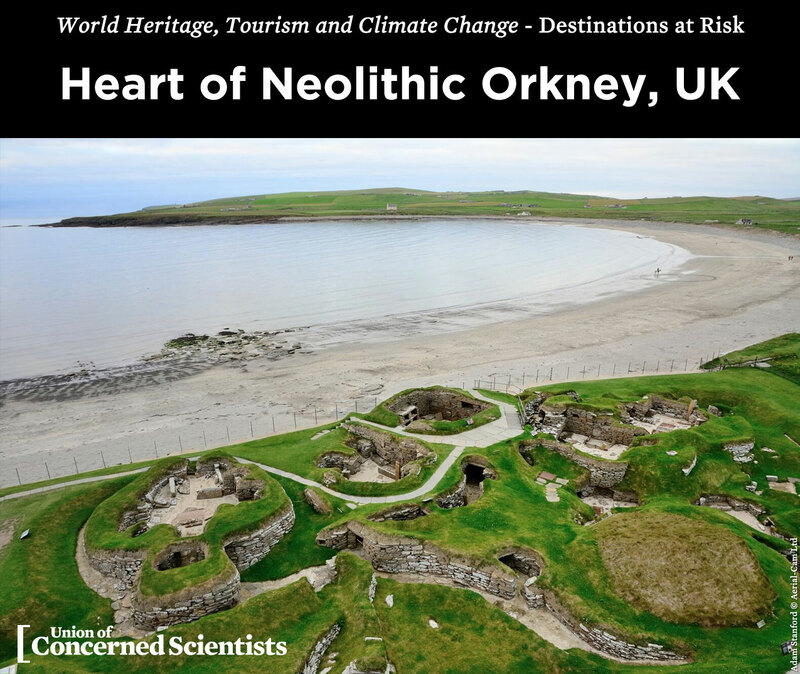 Many of Orkney’s archaeological sites are on the coast because of the importance of the islands as a center of North Atlantic trade and commerce for at least 3,000 years. At least half of these sites are under threat from coastal erosion. A sea wall was first constructed to protect Skara Brae from erosion in 1925, but despite regular repairs to the wall the coast continues to erode around this internationally important archaeological site. Venice and its extraordinary assemblage of architecture is under immediate threat from climate change today. 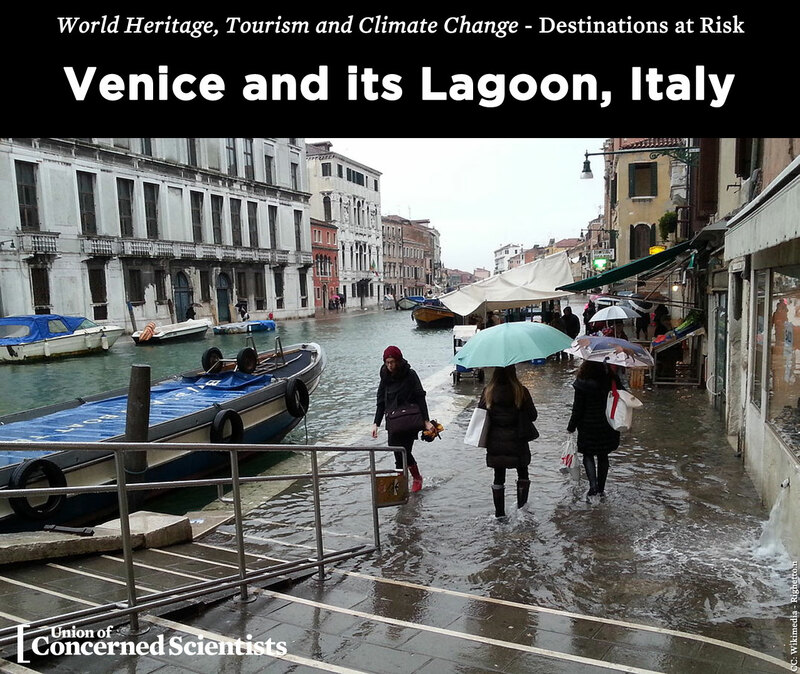 In the face of rising sea levels, worsened by local land subsidence, and increasing pressure from mass tourism, Venice is struggling to maintain both the structures of its buildings and the character of the city. 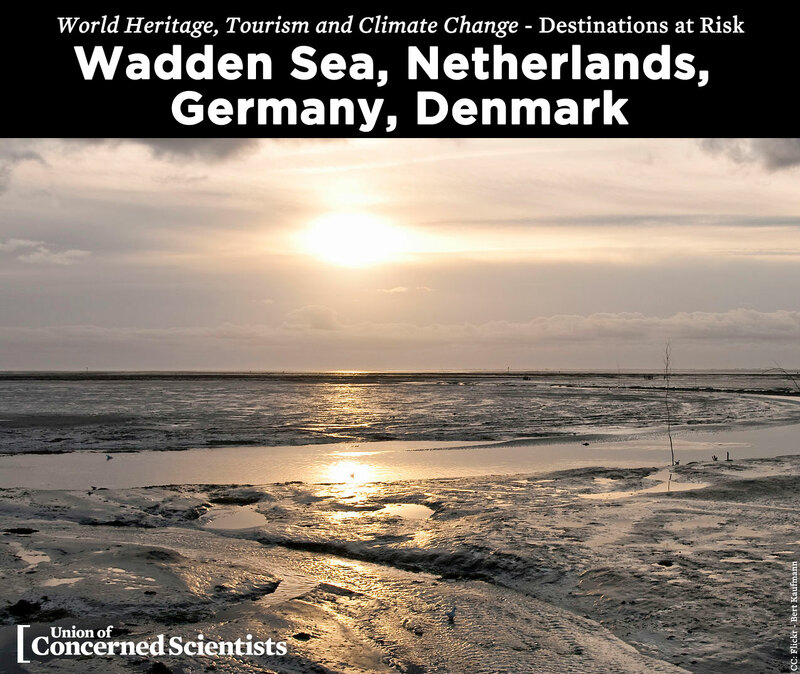 Stretching along the coasts of three countries, the Wadden Sea is the largest unbroken system of intertidal sandflats and mudflats in the world. It is one of the world’s most important bird migration stopovers and it also attracts more than 10 million tourists every year. 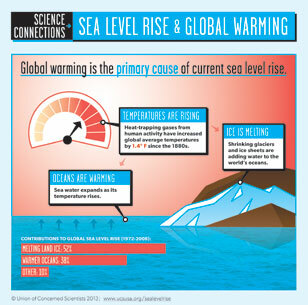 Sea level rise and worsening storm surges will lead to erosion of beaches, mudflats, and salt marshes; damage to dunes; and loss of wildlife habitat. 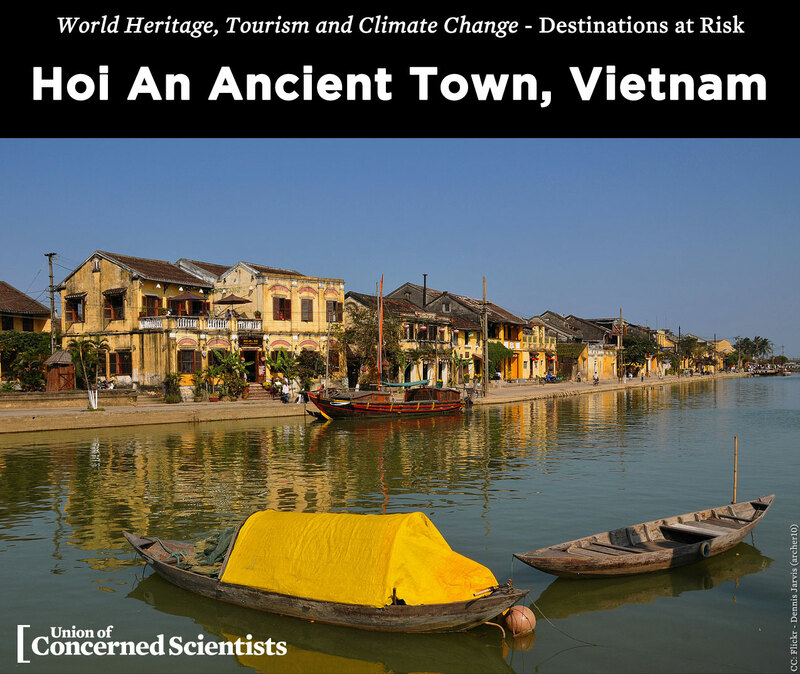 Explore in-depth case studies and snapshots of World Heritage sites at risk. Links go to the relevant sections of the full report (requires PDF download). Great Barrier Reef: The Australian government requested that UNESCO remove a case study on the Great Barrier Reef from the final report. UCS believes that we need to have these important conversations publicly, which is why we published an updated version of the case study on our blog at the same time the report was released. For more, please see lead author Adam Markham’s statement on the Australian government’s intervention. Rising temperatures are increasing wildfire risk throughout the Western U.S.